School breakfast programs help keep kids healthy, but not all students benefit from the program because of constraints like time. Credit: USDA. 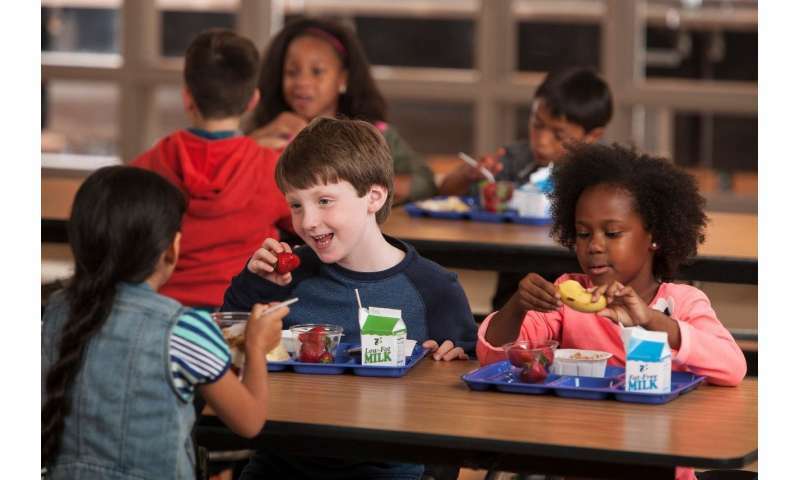 "It's by far the most sophisticated, accurate measurement of school breakfast intake ever done," said Klaus Moeltner, a professor of agricultural and applied economics in the Virginia Tech College of Agriculture and Life Sciences. "We know exactly how much the students consumed and how much time they had to consume it." "The percent of students that go without breakfast because they didn't eat at home and they didn't have time to eat at school goes from 4 to 0 percent when given 10 minutes more to eat, so the most vulnerable segment is taken care of," said Moeltner. "When you move breakfast into the classroom, you have to serve all the students for free, and the associated costs needed to feed all the students must be covered by low income subsidies," said Moeltner. "But many schools don't have a large enough proportion of subsidized students and therefore cannot afford to serve in-classroom breakfasts because they lack the subsidies to offset the costs." "Our results show that there's no change in average consumption, which is reassuring," said Moeltner. "Kids aren't overeating because of the extra time. Instead, they're substituting—if they used to eat breakfast at home, now they eat it at school."